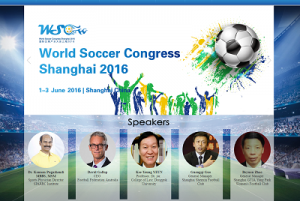 Sparrc Institute is participating in World Soccer Congress 2016 Meet. Our Sports Medicine Expert Dr Kannan Pugazhendi is selected as one of the key speakers; he will be addressing the huge gathering and will be giving a speech (keynote) on Sports Medicine & Rehabilitation Innovation. Feeling honoured to be part of this international forum. One Response to "World Soccer Congress 2016 – Shangai China"
hi,we are proud that an indian dr is participating in a world soccer congress. congratulations to spaaac instutation.